I take a look at RealScam.com occasionally but I just found the account says it's suspended. Anyone have any info about this? It's like the site went into the twilight zone. How cool would it be for RealScam to go under and Scam to come back to life. I'm tellin you we would have ourselves a MIRACLE! I'm a very forgiving person and I could even feel good about the Admin being successful once again. Man am I out there. Dreamin of the old Scam and spending hours reading what all was said daily on this forum, so much fun. I've been to so many forums and nothing compares to what Scam used to be. It was up and active a little after 6am this morning. They have been having problems with their hosts (Sucuri) firewall on and off. But, the page showing up now (cgi-sys/suspendedpage.cgi) belongs to the registrar (GoDaddy). Thanks, I'm sure it will be back very soon. Was just a little different this time so wondered what the issue was. If GoDaddy ticked Heather off know she'll have plenty to say about it. We'll get the scoop. RealScam is still showing as being suspended by GoDaddy. Has anyone found out why? RealScam has a Facebook page and here's the explanation for the site being suspended, posted today. Ahh, that's likely to do with the USI-tech thread. 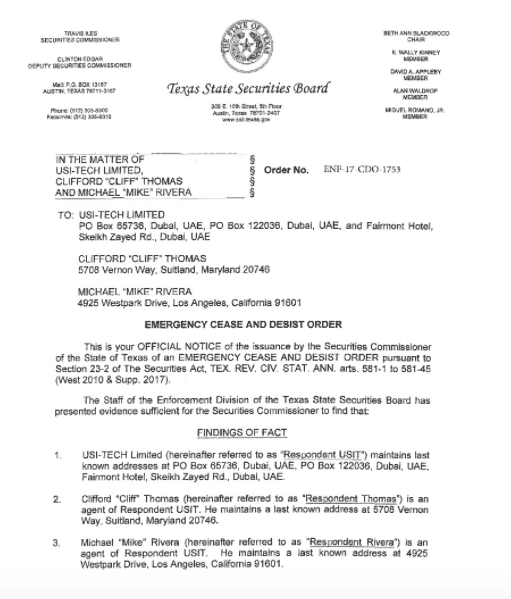 In January 2018, following a December 2017 cease and desist order from the Texas State Securities Board, USI Tech shut down its US and Canada operations. The cease and desist order had come following an internal investigation in which evidence of securities fraud was found. The Texas State Securities Board claimed that USI Tech had failed to disclose details regarding its operations. USI Tech has since blamed its own affiliates and asked them to remove any evidence of promoting USI Tech on websites and social media. Since USI Tech shut down its operations in the US and Canada, many users have been unable to access and withdraw their funds. This is undoubtedly the biggest reminder so far that if it seems too good to be true, it probably is. From USI Tech review - is it Legit or Just Another Ponzi Scheme? If the suspicion is to do with copyright law wonder what was posted breaks that law? Is the document you posted the culprit? Does the hosting sites suspend without researching a claim like this? Last edited by PeggieSue; 03-02-2018 at 01:08 PM. Their scammers, it's likely a false DMCA claim. Possibly even nothing more then a SLAAP (WIKI) attempt. Besides, I'm just guessing that it is the USI-Tech thread. For example, the only people that have a copyright to that document above would be the Texas State Securities Board. Since they are public entity and they likely released the document for public viewing I don't see them filing a DMCA. And as to the article that I c&p'ed containing that document. The only people that have a copyright claim for that would be the author and/or the owners of 99bitcoins.com. And they have been properly cited through the link back. The article I cited is not from RS and I have no idea if that article is even mentioned at RS. As to any researching into a DMCA claim, I know Youtube wouldn't look into it. There are procedures for all this and it likely varies by the different companies involved, GoDaddy and Sucuri in this instance. In order to enforce a DMCA notice the copyright owner ultimately has to file a lawsuit against whatever party they are claiming infringed on their copyrights. There are various provisions in the DMCA also like public works (the document above or the Bible) and 'fair use' to be considered. Oh, and our buddy Bruce has been involved with a false DMCA claim before. He's #11 on this list at webactivism.com/fraudulent-copyright-scam-69-more-perpetrators-exposed/. Here's the article he tried to have taken down at scamwatching.blogspot.com/2011/09/anthony-demarco-dimarco-and-china-trade.html. He succeeded in removing the thread here at Scam that is linked to throughout that article. Oh, and 'mumbles' was the MOD here at Scam that is mentioned in the article. Scammers often use the DMCA in order to try and remove bad press about themselves. For a lot of different reasons I didn't think the article, containing the document you posted, was the document in question. Did think we should clarify it wasn't for all the readers of this thread. I don't know how these hosting sites deal with claims against websites but it doesn't seem fair they would suspend a website for a false claim without researching it first or having some kind of proof. Maybe a lawsuit has been filed. I look forward to finding out what this is all about, waiting for RealScam to come back online. Interesting info there on our Scam.com member, Bruce. Umm, PeggieSue your PM box is full. "PeggieSue has exceeded their stored private messages quota and cannot accept further messages until they clear some space." Yes I've noticed. I thought Heather may ditch GoDaddy so must be more to it. A mystery!